Okay, we’re in SoCal so no fire, but last night Irvine Watchdog sat down with City Council Candidate Carrie O’Malley to ask her some tough questions that have been on the minds of Irvine residents. Due to a death in her family, Carrie had to back out of the Irvine Watchdog Forum at the last minute. As we construct the Irvine Voter’s Guide for our local elections, we wanted to gather Carrie’s positions on important topics. Candidate Bio: Carrie O’Malley moved to Irvine in 1997 where she lives with her husband and two children in Northpark – still in the first home they bought. She started her political career in her own HOA where she ran and won twice serving as the HOA VP. Carrie has spent 24 years in public policy and has served on the OCTA and is chair of the Irvine Taxpayers Association. She is currently the Vice Chair of the Irvine Transportation Commission appointed by Mayor Don Wagner. She is a deep thinker with significant experience in policy development and analysis. Question 1: What is your stance on Measure B / Veteran’s Cemetery / ARDA site? Answer: [For the June election] I worked tirelessly on Measure C which will require 4 of the 5 members of Council to vote on any new taxes. I did this to protect the taxpayers of Irvine. I didn’t take a public position on the other measures. As for the veteran’s cemetery, many people don’t realize that the land swap voted on as a part of Measure B didn’t come through this transportation commission. On November 20th, the latest proposal for the Golf Course as a location for the cemetery will come before the commission. I pledge to review the traffic as well as the fiscal responsibility of this proposal and to honor the majority vote. As with other projects, I have often followed the project through to the planning commission and City Council. Irvine Watchdog has posted an article on the issues that should be addressed regarding the Golf Course option. Read the article here. When asked how she voted on the measures, Carrie responded that her votes are private and she has not revealed them. Question 2: What is your opinion of SB54? Should Irvine remain a sanctuary city? Answer: This is an issue of local control, and I feel that safety is one of the number one priorities for Irvine. In order to maintain Irvine’s Number 1 Safest City title (for the last 13 years) it is important to ensure that police have local control. In my work with the Cal State Assembly, I feel that there are flaws in SB54 the way it is currently written. Question 3: Would you advocate that Irvine stays in the OCFA? Answer: Yes, the OCFA is a wonderful organization that provides a very important service to all of Orange County. At the same time, Irvine is one of these donor cities and as such, I believe that the agreement should be negotiated and I am happy that the vote the Council has taken will allow the city to renegotiate. I hope that Irvine will remain in the OCFA with a renegotiated agreement. Question 4: How would you improve transparency? Would you condone the removal of cell phones during Council meetings? Answer: I have provided my cell phone that I have used for the last 20 years on my campaign statement and on my website and business cards and intend to make this available to Irvine residents. I would also hold regular office hours for the residents to ask questions. As for cell phones on the dais, I am a mom of a new driver so as long as other safety precautions can be arranged whereby I wouldn’t miss an emergency call from my children, I would be fine with removing cell phones from the dais. Question 5: What would you do for traffic solutions in the city? Question 6: What is your position on the Land Trust and Transparency and how would you enforce the Sunshine ordinance for the Land Trust. Answer: With my 2 decades of public policy experience, the Land Trust absolutely needs to be open and respectful of the Brown Act. Question 7: We have seen some flyers and signs that list the “Wagner slate” without you but with other candidates. How does this slate concept work? Answer: The slate consists of Wagner appointees. Anthony Kuo is Wagner’s Planning Commission appointee, and I am the Transportation Commission appointee. When I am out walking the precincts and the streets of Irvine, I am walking as Carrie O’Malley and asking the people of Irvine for their votes. I am an independent deep thinker who is interested in protecting the village plan within the Master Plan and advocating to maintain our open spaces. As a long distance runner, the open space and trails are important. I can’t undo the past. The IBC is a good example of a hodge-podge where they tried to buy their way out of the general plan. Question 8: One of the primary concerns from Irvine residents is the influence of PAC money. Given you are one of the candidates that has received a substantial amount of PAC money, how do you respond to these trepidations from the residents? Would you recuse yourself from votes where the applicant has contributed substantially to your campaign? Answer: I have not reached out to these PACs. As for some of the other campaign contributors, like LSA who does many of Irvine’s traffic studies, I have opposed their studies where they did not align with the master plan or make sense. Follow-up question: But LSA only contributed $490 whereas the BIA has contributed thousands? Follow-up answer: I am a deep thinker and policy person that will vote independently. Question 9: Irvine is a job center, and there seems to always be a big push to get more businesses to locate in Irvine. This is good to a point but has lead to a jobs/housing imbalance (and traffic problem). At what point do we switch from such a high focus on getting more businesses to locate in Irvine to one where we try to just maintain a steady state between the number of businesses moving into Irvine vs the number of businesses leaving Irvine? Answer (from Carrie’s website): As a job hub here in Irvine, we enjoy many benefits; however, we must address our transportation needs and seek out traffic mitigation efforts. 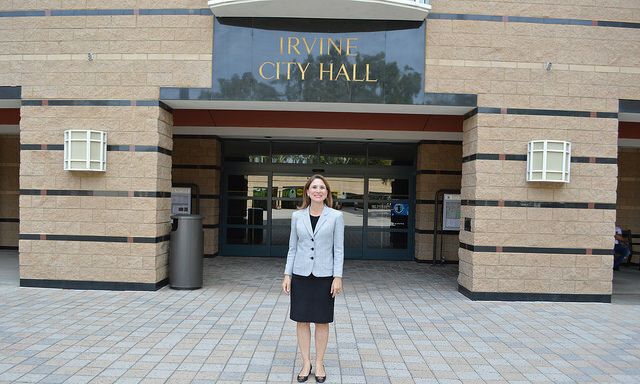 I am committed to protecting and preserving the Master Plan which is the essence of Irvine. This includes protecting our neighborhoods, Villages of Irvine, open spaces, trails, and parks. Question 10: What sets you apart from the other candidates? Answer: I am one of the few candidates who understands the inner workings of the City and can hit the ground running. Question 11: What is your opinion of the Tent City? Answer: I oppose the tent city in Irvine. I walked the river bed and was often in Santa Ana at the courthouse where the encampment was. Public safety is first and foremost. I hold hope that the Mayors’ meeting with the judges can find a better location in a more industrial area that is close to OCTA services. Need services for these folks. Irvine Watchdog has provided these notes to complete our Voter’s Guide (coming soon!) and to provide a more complete view of all of the candidates for the council seats. Carrie spoke extemporaneously with the Irvine Watchdog for almost 2 hours and while she had viewed the forum, we pressed her on a few other issues that had not been covered in the forum. We express our condolences on the loss of her Uncle. Thank you for allowing Carrie to offer her positions and strengths for being an Irvine City Council member. And my condolences as well for your loss Carrie. It seems to me that there are other candidates aside from Carrie, and that only the original (‘chosen’) group have their positions public here on this forum. What about candidates such as Mark Newgent? He is certainly qualified and an Army Veteran as well who might just be an exceptional Council member. And, it would be very nice if all those running for Mayor were to step up and give us their position. Seems that this forum only wishes to have a one sided group and pretend that others are not out there such as Katherine Daigle? For example I’d really like to see a healthy discussion on the Veterans Cemetery and this “ARDA” site as nearly all Irvine residents do not at all understand this picture nor what they even voted for, and if they did may well not have voted as they did with the misleading statement “Save the Veterans Cemetery” as if it needed saving by this. This group here appears to be a closed one sided group that all sing their own praises, although not having any other side interviewed and expressing their positions. As a citizen of Irvine, I’d really like to see and hear more. But I feel as if this whole forum is about just one side of the entire city. You all speak of “Transparency – Accountability – Honesty”, then how is this possible only showcasing your choices alone? It’s kind of like lying to yourself, then convincing oneself it’s true. In other words, not hearing the WHOLE story from all the other candidates as well as this ‘chosen’ group. Hard to know the integrity sometimes. Even the statement about accepting monies from supporters is taken as an ‘evil’ thing. Accusations seem to be all it takes to send someone to prison now in this country. This is not America, nope you’ve fooled yourselves. No rule of law, no fair trial by ones peers, just we are accusing you of being a bad this or that because someone donated more than, what is it $496? ?, or something? That must mean you are evil and you can’t possibly do a good service as a council member or mayor to the citizens of Irvine! Well, I’m accusing this whole forum of just what I’ve said. You’re condemned, and I don’t need any trial or judge or verdict or anything, because this is not America any longer. She attended our forum as well. Again, we are open to all positions and would invite you as well to assist us capturing all sides and all views as well as writing more OpEds. Thank you very much for your input and the time you have taken to post.